You will be picked up from your hotel in Nairobi and transferred to Nanyuki town. Here we will spend the overnight in this old colonial town. On the way sample the spectacular views of the white highlands and the enormous acres of pineapples owned by the Del Monte in Thika. 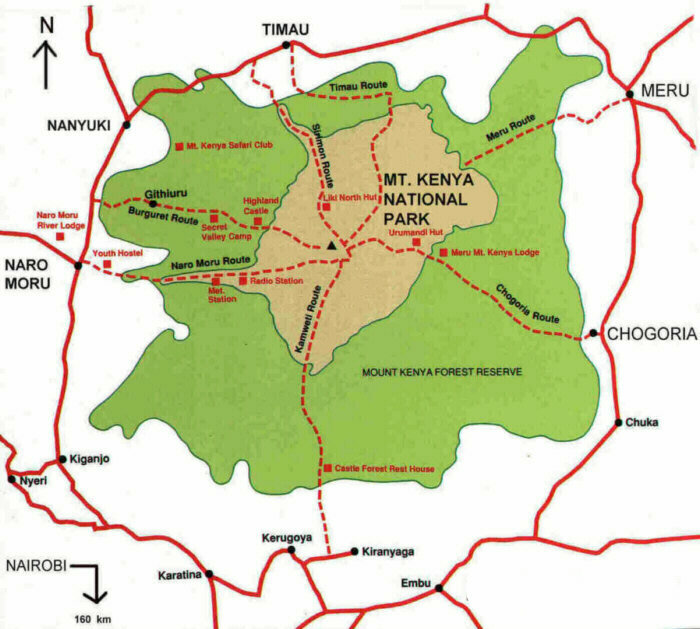 Afternoon, if time allows we visit the Mau Mau caves where we get to see where the freedom fighters hid while fighting with the colonial masters. Dinner and overnight at the hotel. Depart your hotel after breakfast and drive to the Sirimon park gate (alt. 2700m). After signing in with the park officials we will start an acclimatization hike which will see us walking in the tropical forest, occasionally enjoying the sighting of a monkey, a buffalo or even an elephant arriving at the Old Moses (Judmaier) camp (alt. 3200m) in time for lunch. Afternoon at leisure with an optional visit to the weather station, to get acclimatized to the mountain altitude. Dinner and overnight at the camp. After breakfast and with picnic lunches, we start the hike of the moorland vegetation walking through the picturesque views of the Sirimon and the Mackinders valleys arriving at the Shiptons camp (alt.4200m) in the early afternoon. Walk around the camp and later after dinner retire to bed in this camp. Depart the Shiptons after breakfast and make a peak-circuit navigation to the Austrian hut(alt. 4790m). On the way enjoy the views of the Simba col and the Lewis Glacier arriving at the Top Hut in time for a hot lunch. Afternoon at leisure, dinner and overnight at the camp. At exactly 04h30, wake up and have some tea and biscuits. Start the attempt of the summit peak (The Point Lenana alt. 4985m) which is the highlight of our trip! Take photos with the African sunrise and its also possible to see the Mt Kilimanjaro if the weather is clear Descend down to the Mintos camp (alt, 4100m) where we will have some breakfast. Descend further down to the Meru Mt.Kenya Lodge (alt.2700m) where we will spend the night. Depart the lodge after breakfast and walk through the spectacular bamboo forest to connect with the 4x4 vehicle to Chogoria town where we will connect with our transfer vehicle to Nairobi.